How wide do you want? Sigma’s ultra wide-angle zoom is very wide, very fast, and very good. Designed for APS-C format cameras, it has the field of view equivalence that a 15-30mm lens would in full frame. Many wider zooms for the cropped format are relatively slow lenses, this zoom has a fast maximum aperture that remains constant throughout the zoom range. Just How Wide Is It? One of the better aspects of the APS-C format is that lenses tend to be smaller and lighter than equivalent lenses for full-frame format DSLRs. Taking into consideration the 1.5X or 1.6X crop factor means that it’s relatively easy to get a lot of telephoto, but going wide isn’t necessarily that simple. To have an ultra wide angle field of view requires a very short focal length lens. So, while some APS-C format users are thrilled that their telephoto lenses benefit from the crop factor, their older wide angles aren’t very wide anymore. Of course, many users of the crop factor DSLRs don’t have older lenses to use on their new digital cameras, but they still want wide angle lenses. Despite what some neophyte photographers tend to think, there is more to photography than ‘zooming in’ on subjects. It’s nice to have a full range of focal lengths to choose from, regardless of what format the camera is. A 10mm lens has a field of view of 109 degrees on the APS-C format. Compared to the 76-degree field of view that an 18-55mm kit lens offers at the 18mm end, that’s quite a lot more wide angle. It’s so wide that there are some visible distortion effects at the widest end. There are plugins for most of the major image editing programs that can help correct it. Plus, you can frame subjects in such a way as to limit the wide angle look. 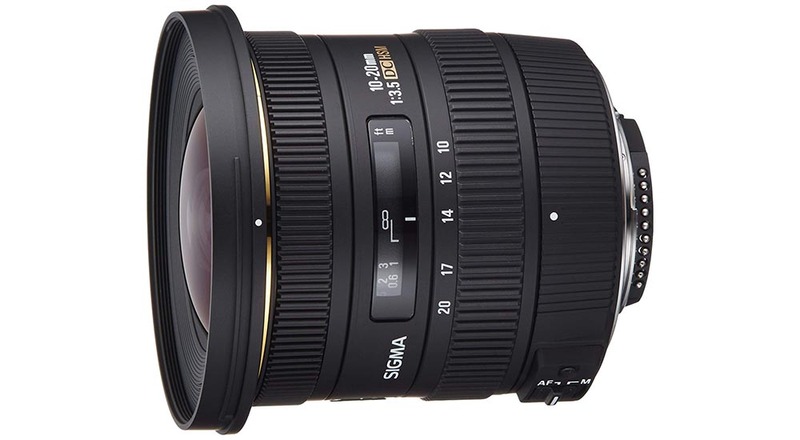 Sigma 10-20mm f/3.5 is specifically designed for APS-C format cameras like the Nikon D3400 thru D500 cameras or the Canon EOS Rebel line of digital SLRs. Comparable focal length range to full-frame is 15-30mm. Using this lens on a full-frame camera will either cause some vignetting issues or put the FX camera into DX mode. The maximum aperture is f/3.5, which remains constant throughout the zoom range. Many other lenses in this focal length are slower and have a variable maximum f-stop. 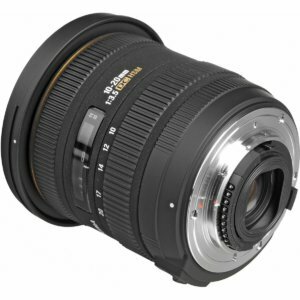 For instance, the previous Sigma 10-20mm lens has a variable maximum aperture of f/4-5.6. So, this newer lens is a significant improvement. Maximum aperture of f/3.5 is complemented on the other end by stopping down to f/22. Stopped down and zoomed out to widest angle, there is an amazing deep depth of focus. Use the close focusing capability of 9.4 inches to create some truly stunning views. Stopping down does cause some overall loss of sharpness due to diffraction effects, but that is minimal. Even at moderate apertures, this ultra wide lens provides a great depth of field. Zooming and manual focusing are controlled by separate rings, both of which are generously wide and slightly padded. The texture of the rings is similar but different enough to be discernible. Autofocus is driven by an internal hyper-sonic motor (HSM) which is very quick and mostly silent. Manual focus can be achieved in any focus mode by simply twisting the ring, or you can use the switch on the lens or on your camera. Physical dimensions of the lens are relatively compact at 3.5 inches long and a diameter of about 3.5 inches. Though compact, it feels substantial with a weight of just a tad over a pound, 18.3 ounces. A filter diameter of 82mm means you’ll have to use some large polarizers, but the front element doesn’t move during focusing, eliminating that minor annoyance. Specifications are necessary to consider, but what’s really on your mind is how sharp it is. Performance is actually very good. Wide open, corners and edges are a little soft and show some light falloff, but that improves stopped down two f-stops or so. There is hardly any distortion, except at the widest end, and even that is minimal considering how extremely wide this lens is. Other optical problems like color fringing and flare or ghosting are surprisingly well managed. Ultra wide angle zooms have come a long way. Special construction features like ELD extraordinary low dispersion (ELD) and special low dispersion (SLD) glass elements, several aspherical elements, and multi-coated optics make this lens a solid performer. Few of these issues would even be noticeable in landscape and other nature views. Used for architecture or realty imaging, though, and it is good to be aware of them. Proper framing, stopping down a stop or two, and keeping horizons straight will help a lot. There is a level of user that some magazines have labeled as prosumer. A prosumer user is well beyond the beginner stage, perhaps even beyond intermediate. Many very good photographers use APS-C format DSLRs to create superb images. Some even work as full time or part time professional photographers. That’s the photographer Sigma seems to be aiming this lens at. Found at prices in the $400 range, it is well within the budget of a lot of pros and other serious photographers. Anyone wanting more wide angle capabilities than the ‘standard’ zoom lens of 18-55mm will be well served by this lens. Nature lovers will be thrilled to have a compact, yet rugged and capable lens for landscapes and other scenes. Street photographers will appreciate the responsiveness of the lens along with the wide views. Real estate and architectural photographers will especially find the wide view couple with a fast aperture to be useful. Basically, this lens is for any level of photographer who is desiring more reach on the wider end of things, appreciates good quality, and yet doesn’t want to spend an outrageous amount. Fast, small, and very wide.